Earlier today(September 26th) Liv Tyler posed on the black carpet at the 'Gunpowder' preview screening at the BAFTA in London. 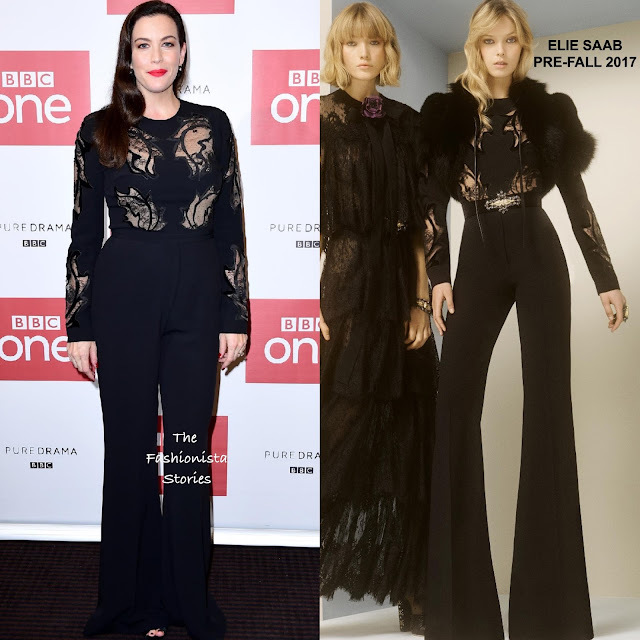 On tune with the black carpet, she wore a ELIE SAAB PRE-FALL 2017 black long-sleeved jumpsuit with velvet motifs and a crepe, wide-leg trousers. Liv ditched the detailed belt buckle the jumpsuit was shown with in the look book which I wish she kept. The simple detail added to the appeal of the jumpsuit. However it didn't hurt her look without it but I wish she hemmed the pants. She finished up with side swept tresses and a bold colored lip. What do you think of Liv's look?